The Buches baggers see him coming and quickly ask…”How many do you need Jesse?” Jesse replies, “Let’s go…they’re hungry out there!” as he places his first order of the day before starting off his morning deliveries. Jesse is a Breakfast-in-a-Bag (B-in-B) sponsor for over 25 Elders throughout the Rosebud Reservation and his delivery list is increasing each month. Jesse works for the Rosebud Sioux Tribe as the Elderly Affairs Coordinator and takes his responsibilities seriously. Working for the Elders in his community comes with hardships, but fortunately he also has a great sense of humor. 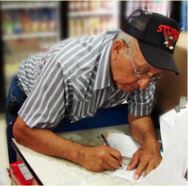 We met Jesse at the Buches Store in Mission recently and did a ride-along with him for one day of deliveries. 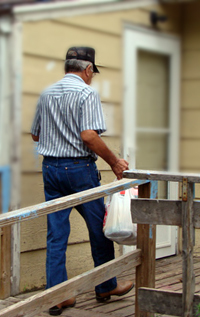 For three days each month, Jesse travels to Mission and collects the Breakfast-in-a-Bag items from Buches and delivers them to the Elders he sponsors. These homebound Elders rely on Jesse for more than just breakfast items — they consider him a friend and an advocate on their behalf. "Whatever you do," Jesse said, "just be helpful." During his monthly deliveries, Jesse has come across some hardships. An elderly woman was days from being evicted. Jesse went to the housing authority and explained that the woman’s daughter had recently passed away and her rent money went towards funeral expenses. Jesse is still delivering B-in-B items to this woman in her house. He gave her the voice that she did not have during a very difficult time and kept her from eviction. Jesse helped another Elder secure water for their home when delays were compounded by more delays. He received a call directly from water resources personnel and they said, “We are taking care of it Jesse”… and they did. During another B-in-B delivery, Jesse noticed the disrepair of an elderly man's screen door. Jesse not only delivered the door, but installed it himself. Other days you may find him delivering B-in-B food with a refurbished appliance for an Elder in need. One of his dreams is to have a warehouse full of appliances that can be refurbished and provided to Elders. Source: Survey Results from the 2009 B-in-B Focus Group held in Mission, SD on May 18, 2009. 40 Elders completed surveys.